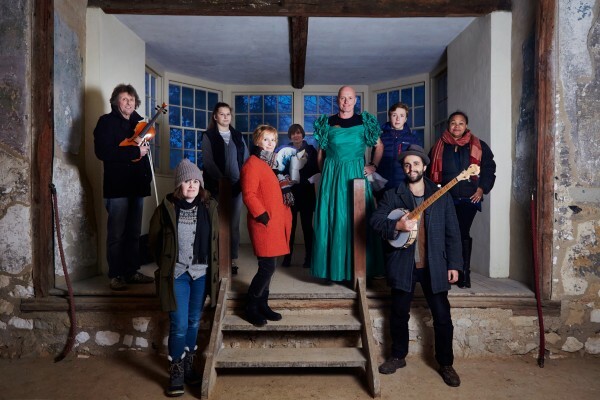 On winter solstice, in the Kentish town of Strood, a group of local residents will be performing No Tail, a unique site specific pantomime conceived by artist Ruth Ewan and devised by a creative team with members of the local community. This production is part of Out of the Ordinary Places (OOTO Places) an Arts Council England funded project, which has been taking place in Strood, Iwade, Sittingbourne and the Isle of Grain over the last few months. Ruth Ewan is one of four artists who has been commissioned to make original work informed by distinct locations and their inhabitants by OOTO Places. The company encouraged engagement with local residents throughout the process, from the initial commissioning to the co-creation of the final works. A challenge faced by all the artists was to engage communities largely unfamiliar with the multifaceted nature of contemporary art in a setting outside of the support structures and institutional frameworks of public galleries or museums. As outsiders to these small towns, the artists took on the responsibility of conceiving projects for these communities and the task of convincing local people to become collaborators and creators of the final works. Many of Ruth’s previous works have revealed or re-imagined overlooked histories, exploring ways in which radical ideas become absorbed within popular culture. Earlier this year her work Back to the Fields at Camden Arts Centre presented a physical manifestation of the French Republican Calendar, which was in use between 1793 and 1805 as a secular alternative to the Gregorian calendar. Ruth placed the plants, animals, objects and minerals that represented each of the days into the gallery, creating a tangible rendering of the revolutionary ideals the calendar signifies. Ruth worked with researcher Astrid Johnston on initial investigations in and around Strood, using local archives and spending time with the residents to gain an insight into the town from their perspective. ‘There is a sense in Strood that the town is in the shadow of its neighbour Rochester. On the bridge that crosses the River Medway, linking Strood and Rochester, there is a sign that points towards “Historic Rochester”, does this imply that Strood is an un-historic place? Of course it isn’t, all places have a history.’ Reconnecting with this history was a key request that emerged from meetings with residents early on in the commissioning process in Strood. Ruth soon found that rather than being un-historic Strood has many fascinating narratives to reveal. One historic feature in particular stood out, Temple Manor, a thirteenth century hall built by the Knights Templar to provide lodging for dignitaries travelling between London and Dover. Temple Manor is a Grade I listed building and a scheduled ancient monument, yet as Ruth described ‘it has become locked in an industrial estate, tightly sandwiched between a drain cleaning centre and a van hire business.’ The discovery of this site was pivotal for the project, presenting itself as an exciting venue to re-activate through staging a performance. Another key finding was a startling image from a section of the St Thomas Altar Piece, painted by Meister Francke in 1424. The image depicts the tail of Thomas Becket’s horse being chopped off by the residents of Strood. Apparently, when Thomas Becket passed through the town he was waylaid by residents who were supporters of King Henry II. They argued with Becket and violently removed his horse’s tail. In retaliation Becket cursed the residents so that all future residents would be born with tails, perhaps giving rise to the nickname “Kentish Longtails”. This painting by Meister Francke and the story it alludes to has informed the central narrative of No Tail. Ruth’s initial interest in pantomime began a few years ago when she watched the Hackney Empire pantomime. ‘I really enjoyed the various levels of humour aimed at different age groups in the audience, and the fact that it was very subversive. One of the things I found most exciting about pantomimes I’ve seen in recent years is the particular energy they seem to emit – the painful jokes, the layers of pomp, the social commentary, the songs, the boos – the fusion of the historic with the contemporary, the ability for the script to immediately absorb and reflect on contemporary life whilst simultaneously acting out some rather ancient performative traditions’. In Strood, the flexibility of the panto format and links to Kentish folk traditions made it an ideal format with which to work collaboratively with local residents. Pantomime is often associated with cheesy lines, and C-list celebrities, yet it also has a rich heritage. Early pantomime was influenced by the Italian commedia dell’arte tradition and seventeenth century masques, however, there are also strong connections to the English folk tradition of mummers’ plays dating back to the Middle Ages. Performed by travelling troupes at festive gatherings, these plays featured archetypal characters and elements we would recognise in panto today, such as stage fights, coarse humour and gender role reversal. There is also a particular link between pantomime and the Kentish folk tradition of Hoodening. The pantomime horse is perhaps a descendent of the Hooden Horse, a wooden horse, mounted on a pole and carried by somebody hidden under a hopsack. Traditionally the Hooden Horse was carried around the local area at Christmas time by a team of farm labourers, who would perform at local houses and shops in return for payment. Although Pantomime has interested Ruth for some time, having no experience of “putting on a show”, she has never known where to begin. ‘Working with producers Idle Women was key to this process; both Rachel Anderson and Cis O’Boyle are experienced performance makers. From there the creative team grew to include Dom Coyote, No Tail’s composer and music director and production manager Bernd Fauler. We’re also working with James Frost an artist with an interest in folk theatre and puppets and musician Ian Cutler, who as a teenager was the fiddler in The Wicker Man.’ Crucial input also came from the research of academic and folk expert Geoff Doel, who contributed to the team’s understanding of Kentish folk culture. Full details of all the OOTO Places projects can be found on the website. OOTO Places is an Ideas Test flagship programme, and ran from September to December 2015.